HOW SUPER - Modist Brewing Co.
With the Super Bowl fast approaching, we are excited to announce our “official” response to the clever Cease and Desist we received from Bud Light back in December. 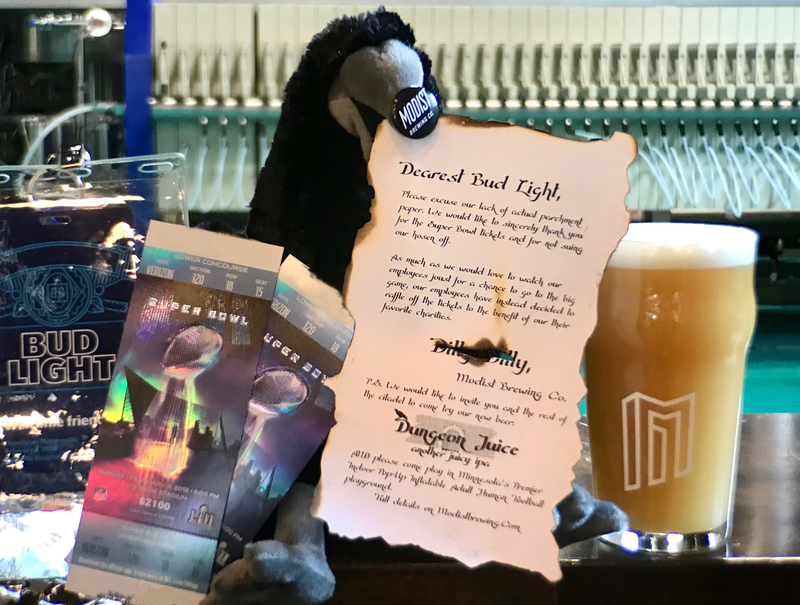 As you might have heard, in addition to the ceasing and desisting, it also landed us two tickets to the big game. As much as we would love to let our employees joust for the right to go, our employees have instead decided to raffle the tickets off in an attempt to raise $50,000 for their favorite charities. 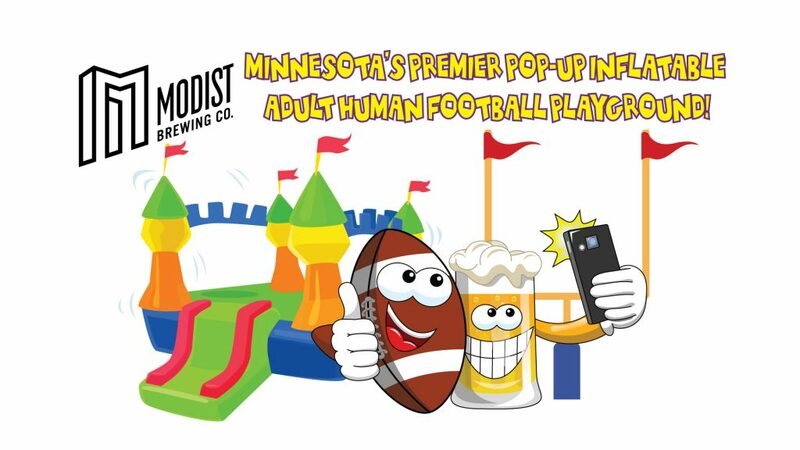 We would also like to invite the Bud Light team and the rest of the citadel of Minneapolis to enjoy our new beer (Dungeon Juice), and come play with us this weekend at Minnesota’s Premier Pop-Up Inflatable Adult Human Football Playground! Full details below. We will be only raffling off 2,000 tickets, limit 2 per customer, with a goal of raising $50,000! In addition to raising money for our causes, our goal is to also give Minnesotans a really good chance at winning. If you buy 2 tickets, your chances are 1/1,000 (assuming we sell them all). If you and whoever you’d bring get to tickets, your chances are 1/500 – for a prize with a current market value of close to $10,000. It’s kinda cool. 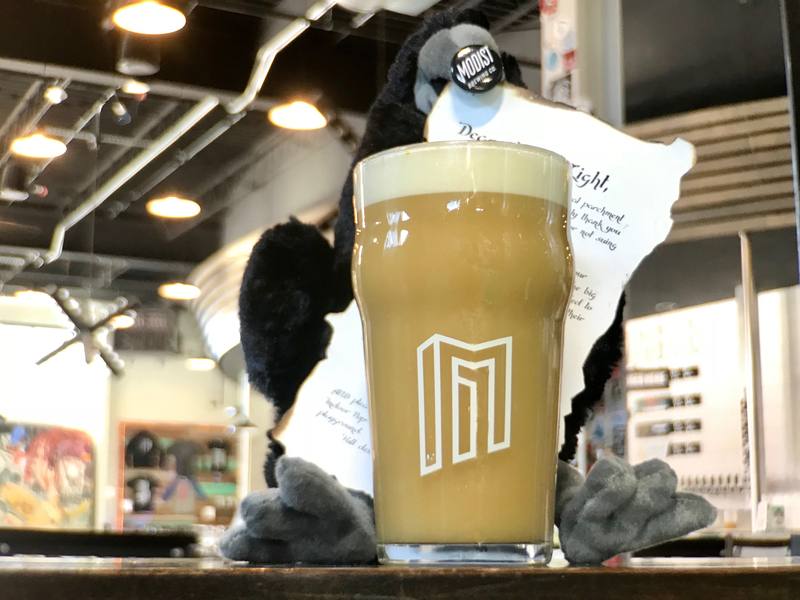 The winners of this raffle will be selected and announced on Saturday, February 3rd at 9pm at Modist’s taproom in the North Loop. The drawing will be broadcast live from Modist’s Facebook and Instagram accounts for all to see. Can someone borrow us one of those bingo ball roller things? 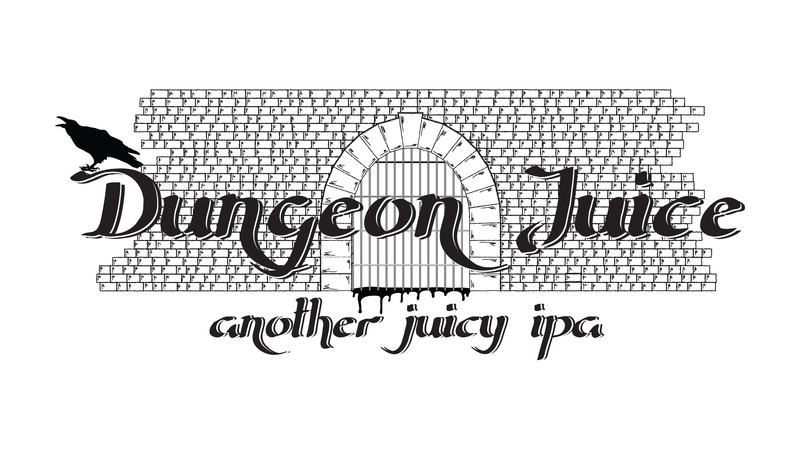 Since we are not legally allowed to run a raffle, the raffle will be handled by our friends/defenders/heroes at the Minnesota Craft Brewer’s Guild. All proceeds from this raffle – every single dollar – will be donated to employee-chosen charities. If you want to learn more about Jack's charity - or if you're able to give more - you can do so HERE. If you want to learn more about Kait's charity - or if you're able to give more - you can do so HERE. If you want to learn more about Eric's charity - or if you're able to give more - you can do so HERE. If you want to learn more about Jackson's charity - or if you're able to give more - you can do so HERE. If you want to learn more about Muggs's charity - or if you're able to give more - you can do so HERE. If you want to learn more about John's charity - or if you're able to give more - you can do so HERE. If you want to learn more about Korto's charity - or if you're able to give more - you can do so HERE. If you want to learn more about Metal Joe's charity - or if you're able to give more - you can do so HERE. If you want to learn more about Chris's charity - or if you're able to give more - you can do so HERE. If you want to learn more about Dixon's charity - or if you're able to give more - you can do so HERE. If you want to learn more about Joe's charity - or if you're able to give more - you can do so HERE. If you want to learn more about Keigan's charity - or if you're able to give more - you can do so HERE. If you want to learn more about Angela's charity - or if you're able to give more - you can do so HERE. If you want to learn more about Ted's charity - or if you're able to give more - you can do so HERE. If you want to learn more about Bobbi's charity - or if you're able to give more - you can do so HERE. If you want to learn more about Angie's charity - or if you're able to give more - you can do so HERE. If you want to learn more about EJ's charity - or if you're able to give more - you can do so HERE. If you want to learn more about Lance's charity - or if you're able to give more - you can do so HERE. If you want to learn more about Kirk's charity - or if you're able to give more - you can do so HERE. If you want to learn more about Kale's charity - or if you're able to give more - you can do so HERE. If you want to learn more about Kiri's charity - or if you're able to give more - you can do so HERE. If you want to learn more about Ian's charity - or if you're able to give more - you can do so HERE. If you want to learn more about Karly's charity - or if you're able to give more - you can do so HERE. If you want to learn more about Dan's charity - or if you're able to give more - you can do so HERE. I mean, HERE. We’re gonna, like, rent some huge inflatable football things and let you play with them. It’ll be hilarious.